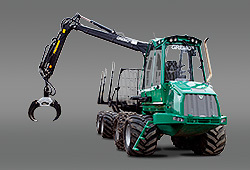 The Gremo 1050H is an innovative harvester based on the well approved previous model HPVR. It is equipped with a stronger engine and a re-designed cab with curved window panes for improved visibility and working ambiance. The 1050H also features improved working hydraulics including a variabel pump with higher flow-rate and a re-designed control system permitting easier setting of the boom via colour screen. 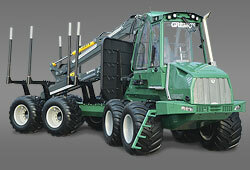 Gremo 750F is a small forwarder designed for comfort and a low unladen weight. With a high level of comfort and exceptional operating reliability all types of thinning are profitable for you as the user. 750F has a powerful Cummins engine featuring common-rail technology. The engine satisfies tier-3b requirements and has a torque in excess of 600 Nm over a wide speed range. In addition to the engine’s strength, it is also light, compact and silent. 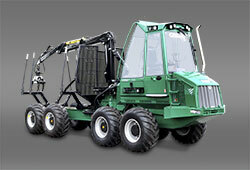 Gremo 1050F4 is a modern version of the popular forwarder 950F. With 1050F4 you get a powerful machine that is perfect for thinning work and hours of driving timber. Wetlands are no barriers - just add the bogie front and back, and the machine will move safely ahead. 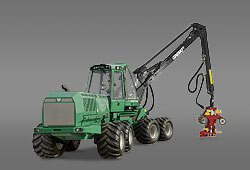 The Gremo 1250F is a strong and flexible forwarder in the 14 tons class. Like its popular brothers, the 1250F easily makes its way on any ground. The 1250F is equipped with Gre-Vt. A novelty eagerly asked for by the market and for the first time introduced by Gremo. Models that have been discontinued and are only available on the used machine market. Here you can order our jackets, trousers, overalls, tops, bags, etc.